Everywhere we turn, it seems as if we are receiving one more message telling us that we cannot trust people. We’re advised to do background checks on the people that we date, to read our children’s text messages, to never accept a check when selling something to a stranger, and to check and double-check that our doors are locked at night. These are just a few examples. Now, as individual pieces of advice, all of these are very sound. Doing these things keeps ourselves, our property, and the people we care about as safe as possible. Then there is the news, where we receive more messages than anywhere else that people as a whole cannot be trusted. What many of us don’t realize is that while they may save some people from harm, and that’s great, these messages are also emotionally damaging to individuals and to society. After all, how healthy can we be, if our default emotion in our interactions with others is suspicion? When we take risks and rewards into consideration, what are we really saving ourselves from if we spend our lives in a state of suspicion? What is the impact of all of this mistrust on our collective psyche? When the default state of mind is mistrust that damages our ability to form bonds with one another. It becomes another hurdle to cross in order for people to come close to one another. The question is, what can you do to remain a trusting person while still maintaining a sense of safety? Most of us are okay with a sensible level of mistrust. For example, if we sell something on the internet, we don’t get offended if the person buying from us wants to meet in a public place. We also don’t mind having our backgrounds checked if we are going to work with children. On the other hand, we don’t appreciate being followed around by suspicious store clerks who think we might shoplift. We also don’t appreciate romantic partners going through our text messages and email looking for evidence of infidelity. When we fail to give people the level of trust they think that they deserve, we sow resentment with those people. Not only that, people with whom we have personal relationships are eventually going to live up to our standards. If our standard is distrust, there is a good chance that they will be pushed to act in the way we expect. More importantly than that, what could be more hurtful than communicating to a friend or loved one that we don’t trust them. The consequences of failing to trust people are playing out on both the national and international stage. Think about crime-ridden inner cities. In many neighborhoods, the police do not trust the members of the community, and they treat them that way. In turn, the members of the community also do not trust the police. The result is that help and communication stop. Resentment festers, and crime increases because nobody is communicating with one another about crimes and ways to improve the community and make it a safer place. If both the police and the citizens could find a way to trust one another, both groups could benefit. They don’t so life and work becomes more difficult for both. Now think about the conflict in the Middle East. Smart military strategists know that there has to be trust and cooperation between the military and the Muslim citizens in the occupied areas. When this trust is secure, the citizens will provide members of the military with useful intelligence and warnings of impending danger. In areas where that trust has been damaged, the soldiers are at increased risk, because they no longer have the community connections that keep them safe. Do you remember the first time you were handed the car keys and given permission to drive somewhere on your own? What about the first time that you were trusted alone for the weekend? Wasn’t that a good feeling? When you show somebody that you trust them, you give them an almost instantaneous self-esteem boost. 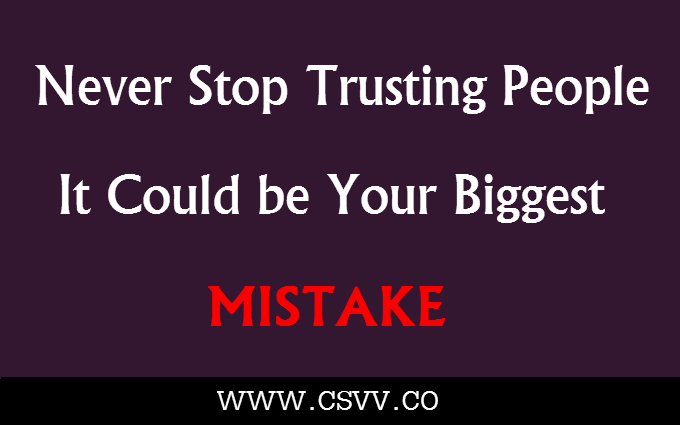 As we mentioned earlier, people often rise to the occasion when it comes to matter of trust. If you set the standard high, they will appreciate the confidence that you have in them, and work to earn the trust you have given them. Giving people your trust also increases your bond with that person. You become closer to one another, and that increases the amount of mutual trust that will exist in the future. Most importantly, when you trust people, you open yourself up to new experiences, we go out from our comfort zone. After all, what can you experience that is new, exciting, or different if you cannot trust somebody to take you on that adventure? Ultimately, almost everything good that can happen to you, is going to happen to you because you take a risk and trust somebody. The first thing that we can do in order to increase trust is to honestly and realistically assess risk. If you are in a situation where safety is more important than risk, then your decision is obviously made for you. On the other hand, maybe the importance of building a relationship is more important than being able to lay aside every suspicion you have. The point is this. Show as much trust as you possibly can while feeling safe as well. You can also increase trust, by making an effort to be open and honest yourself, and to develop friendships with people around you. When everybody in a family, a neighborhood, a class, or a community have tight relationships they are all more likely to be honest in their dealings with one another. Remember that trust isn’t being naive. It is truly our species key to surviving in the future. Daniela McVicker is an author, psychologist and educator. She studied in the United Kingdom, so Daniela came back to USA full of ideas on how to use European experience in American society. She believes that success depends on knowing the ideas that allow you to manage and master the universe of information.